Thrilled that Friday has finally arrived. Thrilled and surprised as well, since I've been feeling all week like I just can't wake up. Moving through the motions of gym, work, home, cook, sleep, with my brain hovering somewhere over last Saturday morning. I'm hoping it catches up to me by tomorrow so I can actually enjoy my days off! Last night my friend Kortney & I went to see the This American Life - Live! show in Scottsdale. It was a live broadcast of the NPR show on stage in NYC, beamed to more than 500 theaters across the US, Canada and even Australia. Bottom line, Ira Glass is the man. At one point in the show, OK Go performed on stage while everyone in the audience played musical notes on an app downloaded on your smartphone. Each person had a different range of notes, based on the color the app opened up to, and the music cues were displayed on screen much like a game of guitar hero. The beautiful music that everyone in the audience made, with rhythm kept by a series of stomps & claps (by the non-smartphone owners) and the singers of OK Go harmonizing on stage...it was incredible. I kept getting such chills, to know this was happening all over the US at the same moment in time, never to be repeated again, what a wonderful moment to be a part of. ...Did I lose you? Pardon me, my geek is showing. Onward, to Powder Room Fashionista week two! 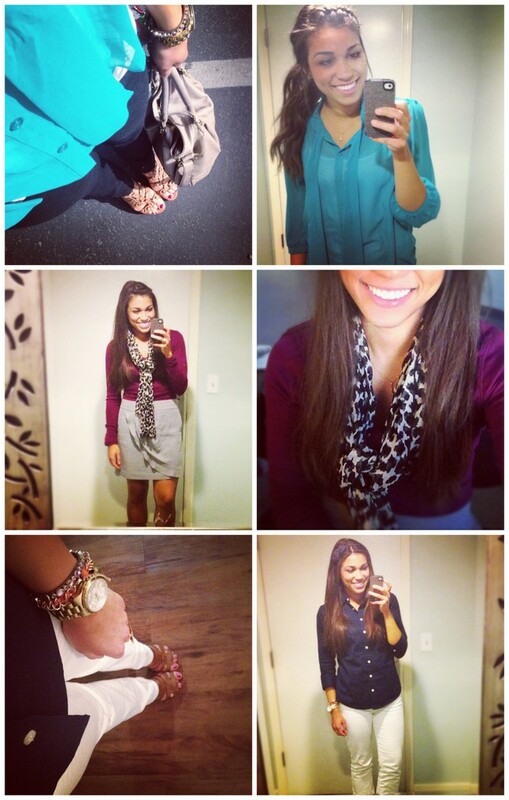 Have your own powder room fashionista photos to share? Link to the post in the comments below! I'm a new reader of your blog and I love the idea of "powder room fashionista". That's really the only time I ever take photos as well. ha. *I own the same top from look #1 in red! Love it. I love the concept of this post! And the name is genius:) TGIF!!! Fun post! I like all of your outfits! I think I could benefit greatly from owning a solid percentage of your wardrobe. I'll pay for shipping. (: Haha.